Bioluminescence has a variety of uses in the deep, where there is little or no light. It can be used to hide from or confuse predators, to attract or see prey, and for recognition of potential mates. Bioluminescence differs from phosphorescence or fluorescence, and is produced in specialised organs by a light-producing chemical reaction. Many types of marine organism, including some bacteria, jellyfish, krill and squid, are able to produce bioluminescence. Known as the giant hatchetfish (Argyropelecus gigas), this fish actually only reaches 12 centimetres in length. It lives in the zone at the bottom of the sunlit layer and searches, with eyes that are aimed upwards, for prey detected as faint shadows overhead. 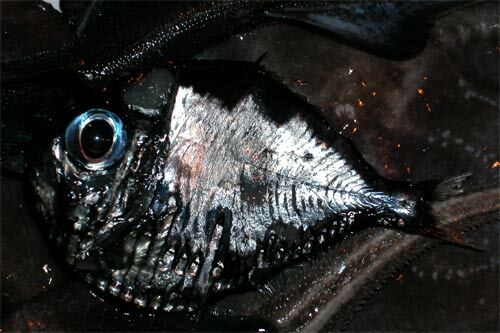 To bluff predators that could use the same technique to detect it in turn, the hatchetfish has light organs and reflective strips along its undersides that hide its silhouette from below by matching the level of light coming from above (counter-illumination).